The problem with smartwatches is that they're just not smart enough to justify the price or upkeep. Mobvoi is working hard to change this perception. While you've probably never heard of Mobvoi, the nearly 1-year-old company is worth getting to know. Based in Beijing, it's backed by Google and deems itself an AI startup that happens to make gadgets like smartwatches. In fact, the company's first wearable, the Ticwatch, has been one of the top selling smartwatches online in China, founder and CEO Zhifei Li says. On Tuesday, Mobvoi is showing off its second act -- the Ticwatch 2 -- to global consumers on Kickstarter. Deliveries are expected in September. We got our hands on the Ticwatch 2 this month and were impressed. The Ticwatch 2 combines the affordability of a Pebble with the features of a Samsung Gear S2, both of which were our top smartwatch picks for 2015. At $99, the early backer price of the Ticwatch 2 costs as much as a Pebble Classic. But it has an interactive bezel (you "tickle" the side), 1.4-inch color OLED display, a mic and speaker, and touts wireless charging. There's also a built-in optical heart rate sensor, accelerometer, GPS and gyroscope to track fitness activity and activate gesture controls. The Samsung Gear S2 has comparable features -- with a slightly smaller display and better resistance against water -- but costs $200 more and is only compatible with Android devices. The Ticwatch 2 is powered by Mobvoi's own Ticwear operating system (based on Android), which will work with both Android and iOS phones. When the Kickstarter campaign ends, the sporty Silicon band "Snow" and "Charcoal" models will jump up to $199. Meanwhile, the "Oak" and "Onyx" models, which feature more premium materials like a leather band and stainless steel body, will be priced at $249 and $299, respectively. Mobvoi met its Kickstarter goal of $50,000 in less than a day. Of all the features, the biggest standout is Ticwatch's voice assistant, which is easy to use and super fast at translating speech. And because the Ticwatch 2 has a speaker, we didn't have to look down at the watch to get information like the weather. Instead, it read the forecast aloud after we asked for it -- like a real personal assistant would. Using a wearable device should feel like a natural experience that makes you forget you're interacting with a piece of technology strapped to your body. Most of the devices we've previously tried fail this test. The Ticwatch 2 scores higher than most by focusing on the voice assistant and taking advantage of natural gestures like massaging the side of the bezel. But for the process to feel more natural, it could benefit from being a bit smaller and thinner. 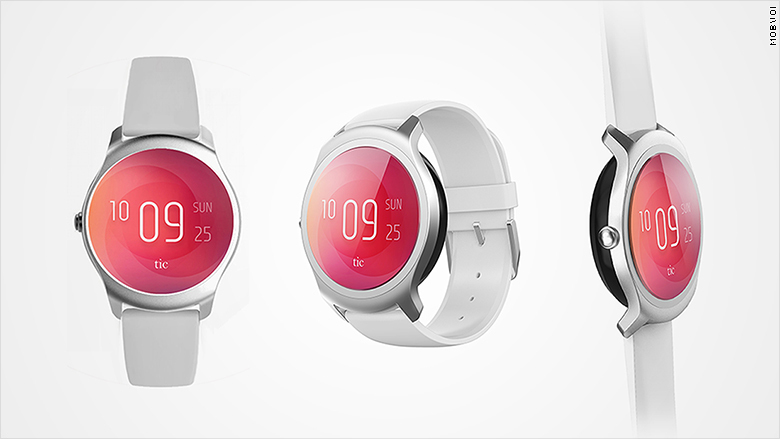 Overall, however, Mobvoi proves that smartwatches can -- and should be -- powerful and affordable at the same time.